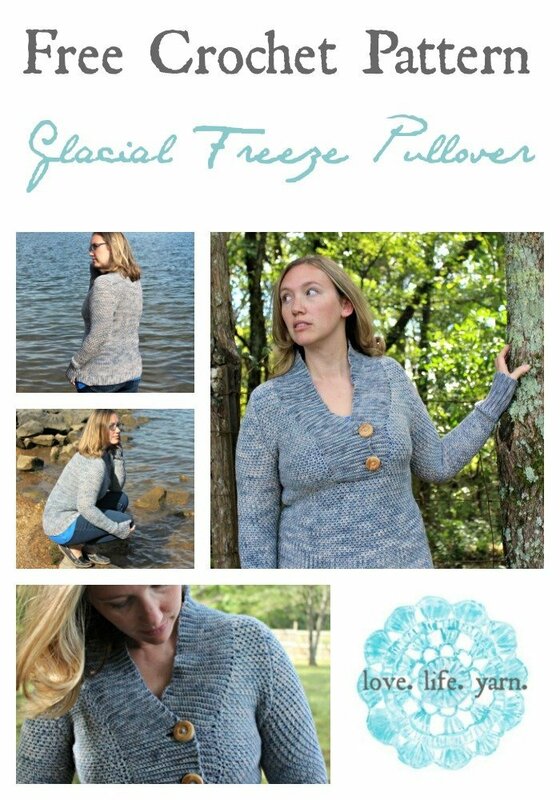 Glacial Freeze Pullover - Free Crochet Pattern - love. life. yarn. Oh, fall. How I love you! This is most definitely my favorite time of year and I know I’m not alone in that feeling. Almost all of September was still in the 90’s here and I was so longing for some fall weather. It has finally arrived!! The only bad thing is that it brought quite a bit of rain with it. Oh, well – you win some, you lose some, right? I think one of my favorite things about fall is the clothing that comes back out. Boots. Sweaters. Scarves. Jackets. And, oh, how I itch to be working with yarn all the time. I have a hard time keeping in the knit or crochet mood when it’s so hot out and find myself really slowing down in the summer and only working on published work but once fall hits I start breaking out all the yarn, hooks and needles! 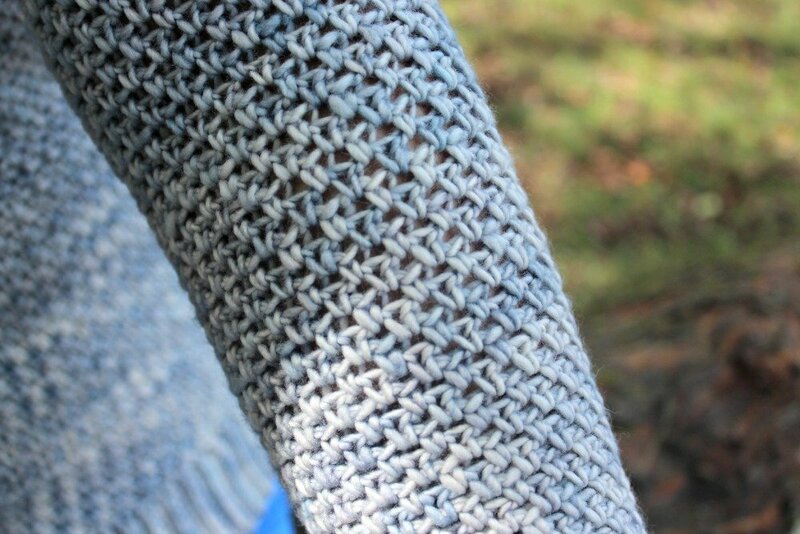 Find this pattern on Ravelry here! This pattern does involve seaming but I have really come to love finishing. There is something therapeutic to me about blocking the pieces flat and then seaming them together. I love seeing how the sweater really comes together while seaming it. Not sure why – I mean, I do love projects that have very little finishing but I really, really love projects like this that I put a lot of time and effort into and they come out even better than I pictured. 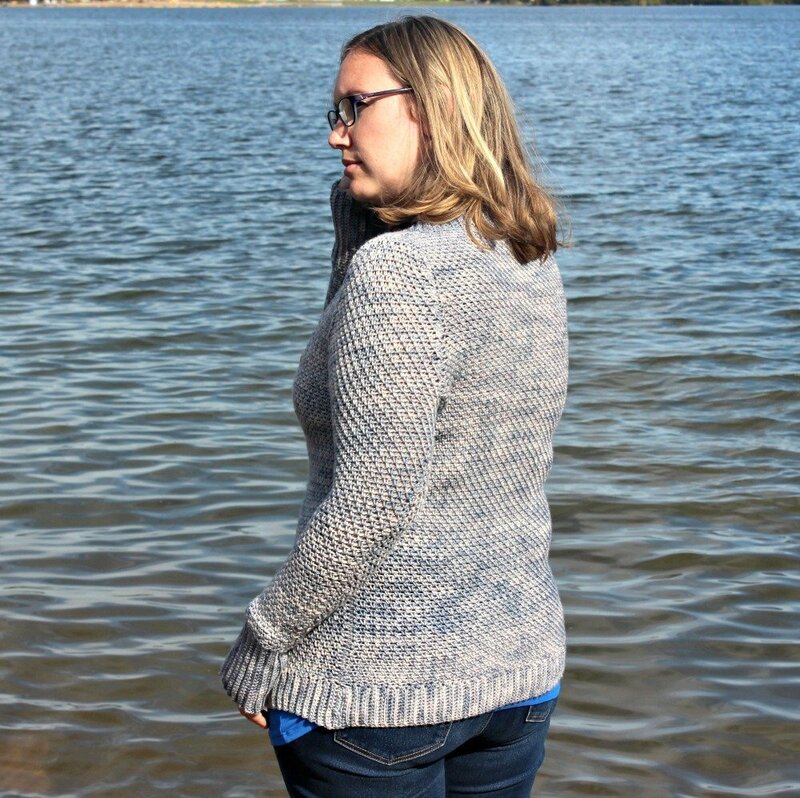 I hope you don’t let the finishing part make you shy away from sweaters like this one – they are really worth the effort and I know I will wear this one for a very, very long time. 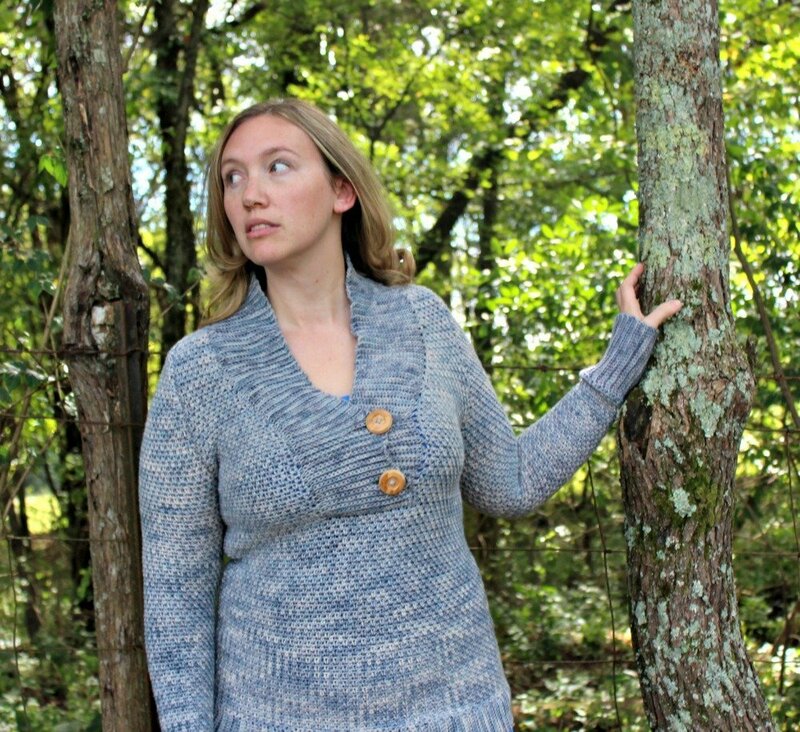 If you haven’t made a sweater before, now is the time to do it!! I am wearing this sweater with negative ease, but if you prefer a more relaxed or oversized look make sure it has 2″ or more ease. Row 1: Ch 1, sc in first sc, *ch 1, sk next sc, sc in next ch-1 sp; rep from * to last 2 sts, sc in ch-1 sp, sc in last sc, turn. Row 1: Ch 1, sc in first sc, *ch 1, sk next sc, sc in next ch-1 sp; rep from *, ending with ch-1, sc in last st, turn. Row 2: Sc in first sc, *sc in ch-1 sp, ch 1, sk next st; rep from *, ending with sc in ch-1 sp, sc in last sc, turn. 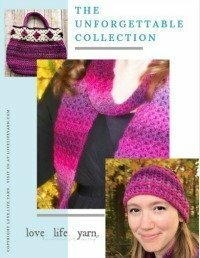 On some areas, you will have to work the pattern stitch over an uneven number of stitches. If working shaping on each side, the pattern is reversed, with 2 sc at the beginning and a ch-1, sc at the end. To keep the pattern consistent, always sc in a ch-1 sp and skip the sc unless it is at the end of a row. With smaller hook, ch 13. Row 1: Sc in 2nd ch from hook and in each ch across, turn – 12 sc. Row 2: Ch 1, sc blo in each sc across, turn. Rep Row 2 until Ribbing meas 17 (19, 21, 23, 25)”, ending with WS row. Do not turn at end of last row. Change to larger hook. Row 1: Ch 1, sc 84 (94, 104, 114, 124) evenly across, turn. Rows 2-76: Ch 1, work in Stitch Pattern to end, turn. Row 1: Sl st in first 4 (4, 4, 6, 6) sts, ch 1, work in Stitch Pattern to last 4 (4, 4, 6, 6) sts, leave last 4 (4, 4, 6, 6) sts unworked, turn – 76 (86, 96, 102, 112) sts. Row 2: Ch 1, work even in Stitch Pattern, turn. Row 3: Ch 1, sc2tog, work in Stitch Pattern to last 2 sts, sc2tog, turn – 74 (84, 94, 100, 110) sts. Rows 4-17: Rep Rows 2-3 – 60 (70, 80, 86, 96) sts. Rows 18-38: Ch 1, work even in Stitch Pattern, turn. Work 4 more rows even in Stitch Pattern. Row 39: Sl st in first 8 (11, 12, 15, 20) sts, ch 1, work in Stitch Pattern to last 8 (11, 12, 15, 20) sts, turn, leaving remaining sts unworked – 44 (48, 56, 56, 56) sts. Work same as Back to Row 53. Row 54: Ch 1, work first 32 (37, 42, 47, 52) sts in Stitch Pattern, turn, leaving rem sts unworked – 32 (37, 42, 47, 52) sts. Rows 55-76: Ch 1, work even in Stitch Pattern, turn. Row 1: Sl st in first 4 (4, 4, 6, 6) sts, ch 1, work in Stitch Pattern to end – 28 (33, 38, 41, 46) sts. Row 3: Ch 1, sc2tog, work in Stitch Pattern to end, turn – 27 (32, 37, 40, 45) sts. Row 4: Rep Row 3 – 26 (31, 36, 39, 44) sts. Row 5: Rep Row 3 – 25 (30, 35, 38, 43) sts. Row 6: Ch 1, work even in Stitch Pattern, turn. Row 7: Ch 1, sc2tog, work to last 2 sts, sc2tog – 23 (28, 33, 36, 41) sts. Row 8: Rep Row 6. Rows 9-11: Rep Row 3 – 20 (25, 30, 33, 38) sts. Row 12: Rep Row 6. Row 13: Rep Row 7 – 18 (23, 28, 31, 36) sts. Row 14: Rep Row 6. Rows 15-17: Rep Row 3 – 15 (20, 25, 28, 33) sts. Row 18: Rep Row 6. Row 19: Ch 1, work in Stitch Pattern to last 2 sts, sc2tog – 14 (19, 24, 27, 32) sts. Rows 20-21: Rep Row 6. Row 22: Rep Row 3 – 13 (18, 23, 26, 31) sts. Rows 23-24: Rep Row 6. Row 25: Rep Row 19 – 12 (17, 22, 25, 30) sts. Rows 26-27: Rep Row 6. Row 28: Rep Row 3 – 11 (16, 21, 24, 29) sts. Rows 29-30: Rep Row 6. Row 31: Rep Row 19 – 10 (15, 20, 23, 28) sts. Rows 32-33: Rep Row 6. Row 34: Rep Row 3 – 9 (14, 19, 22, 27) sts. Rows 35-36: Rep Row 6. Row 37: Rep Row 19 – 8 (13, 18, 21, 26) sts. Rows 38-39: Ch 1, work even in sc, turn. Row 38: Rep Row 3 – 12 (17, 20, 25) sts. Row 39: Rep Row 19 – 11 (16, 19, 24) sts. Row 40: Rep Row 3 – 15 (18, 23) sts. Row 41: Rep Row 19 – 14 (17, 22) sts. Row 42: Rep Row 3 – 13 (16, 21) sts. Row 43: Rep Row 3 – 12 (15, 20) sts. Join yarn at opposite edge and repeat for second side. With smaller hook, ch 25. Row 1: Sc in 2nd ch from hook and each ch across, turn – 24 sts. Rep Row 2 until Ribbing meas 7½ (8, 8½, 9½, 10½)”, ending with WS row. Do not turn at end of last row. Row 1: Ch 1, sc 38 (40, 42, 48, 52) sts evenly across – 38 (40, 42, 48, 52) sts. Rows 2-5: Ch 1, work even in Stitch Pattern, turn. Row 6: Ch 1, 2 sc in first st, work in Stitch Pattern to last st, 2 sc in last st, turn – 40 (42, 44, 50, 54) sts. Rows 7-56: Rep Rows 2-6, 10 times – 60 (62, 64, 70, 74) sts. Rows 57-60: Ch 1, work even in Stitch Pattern, turn. Row 1: Sl st in first 4 (4, 4, 6, 6) sts, ch 1, work in st pat to last 4 (4, 4, 6, 6) sts, leave last 4 (4, 4, 6, 6) sts unworked, turn – 52 (54, 56, 58, 62) sts. Row 2: Ch 1, sc2tog, work in Stitch Pattern to last 2 sts, sc2tog, turn – 50 (52, 54, 56, 60) sts. Rows 3-4: Rep Row 2 – 48 (50, 52, 54, 58) sts. Row 5: Ch 1, work even in Stitch Pattern, turn. Row 6: Rep Row 2 – 46 (48, 50, 52, 56) sts. Rows 7-26: Rep Rows 5-6 – 36 sts. Row 27: Rep Row 2 – 34 sts. Row 28: Rep Row 2 – 32 sts. Row 29: Rep Row 2 – 30 sts. Row 30: Rep Row 2 – 28 sts. Rows 7-30: Rep Rows 5-6 – 22 (24, 26, 28) sts. Rows 31-32: Rep Row 2 – 18 (20, 22, 24, 24) sts. Sew Front to Back at shoulder seams. With smaller hook, join yarn with sl st at bottom left of placket. Row 1: Ch 1, sc across 20 sts, sc2tog in last unworked st and side of right placket edge, turn. Row 2: Ch 1, sc backloop only (blo) in each st across, turn. Row 3: Ch 1, sc blo in first 19 sts, sc2tog in last st and side of right placket edge. Rep Rows 2-3 around right placket, right front neck edge, back, and left front neck edge until you reach the bottom of the slanted left neck edge. Place buttons on right placket evenly. Row 1: Ch 1, sc blo in first 3 sts, ch 4, sk 4 sc, sc blo to last st, sc2tog in last st and side of placket, turn. Row 2: Ch 1, sc blo in first 12 sts, sc in next 4 ch, sc blo in next 3 sc, turn. Continue edging until you reach bottom of left placket. Fasten off. Sew left placket over right placket, matching buttons and buttonholes. Sew first inch of open edge of left placket in place. Sew sleeves and side seams. That’s it! 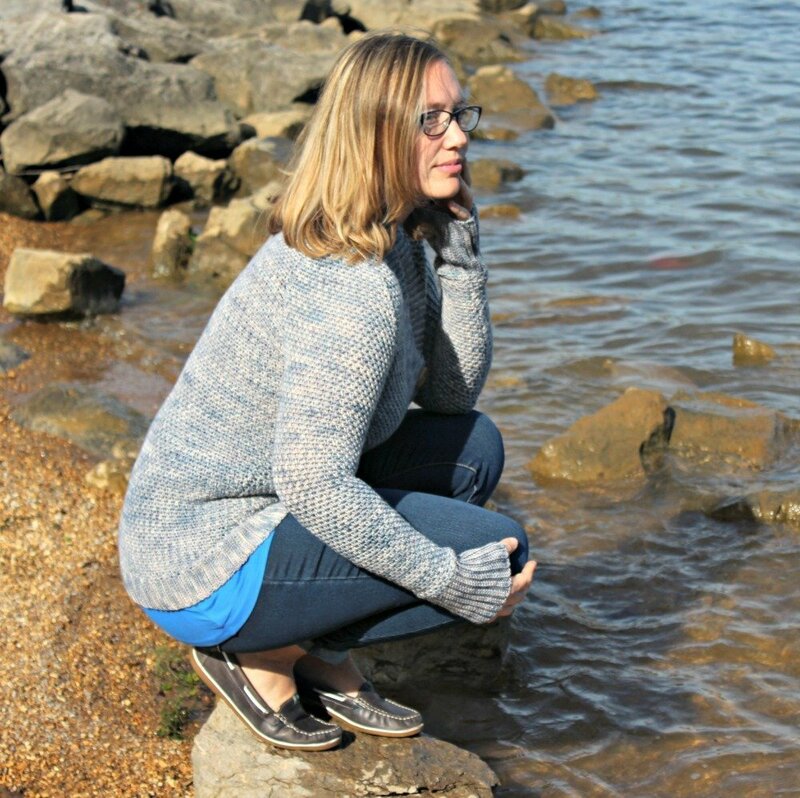 I can’t wait to see what you all make with this free pattern – I had SO much fun designing it and love wearing it as an everyday sweater. I hope you do, too! this sweater looks interesting to make. I cannot wait to get started. Thank you for sharing. Well done! 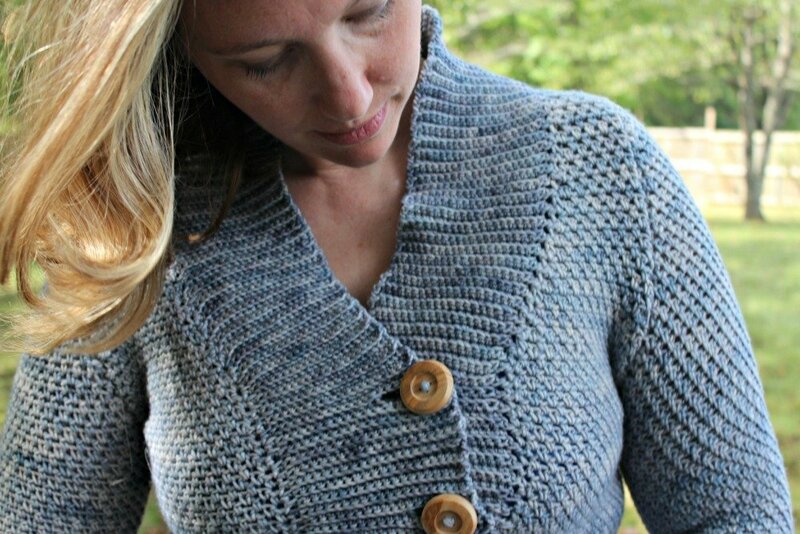 It’s a gorgeous sweater and yes, perfect for fall. Thanks so much for sharing it with us. I understand about your 90’s. We had a cool, wet spell for about two weeks here in Texas and now it’s back in the 90’s again.